A little more than 16 months after announcing the Phil and Penny Knight Campus for Accelerating Scientific Impact, the University of Oregon is inviting the public to celebrate breaking ground on the ambitious $1 billion initiative. A ceremony is slated for 1 p.m. Friday, March 2, adjacent to the current construction site near 1399 Franklin Blvd. Chuck Lillis, chair of the UO Board of Trustees; UO President Michael H. Schill; and Patrick Phillips, acting executive director of the Knight Campus and professor of biology, are scheduled to speak. Representatives of Hoffman Construction, the general contractor for the project, and Bora Architects of Portland, part of the Bora-Ennead architecture team, will be on hand to mark the occasion. The $225 million, 160,000-square-foot first phase, along the north side of Franklin Boulevard between Onyx Street and Riverfront Parkway, is slated to open in early 2020. The effort to rethink research, science education and innovation is made possible by a $500 million lead gift from Penny and Phil Knight. Funding is augmented with $50 million in state bonds approved in 2017. In the short 2018 legislative session, the UO is requesting an additional $40 million in bonds as part of an $81 million higher education construction package, which is a partnership with Oregon State University and Eastern Oregon University. If lawmakers approve the 2018 bond request, the state’s contribution to the project will total $90 million and finalize the capital funding process. As part of the 2018 funding package, the UO has pledged to use Oregon-manufactured wood products — particularly cross-laminated timber — in construction. The university will use the timbers in many public-facing areas of the building. Over the next 10 years, the Knight Campus will house an estimated 30 principal researchers and their teams, generating an estimated 750 new jobs and driving an estimated $80 million in annual statewide economic benefits. Cutting-edge labs and open, collaborative spaces are expected to attract top researchers in fields new to the UO — such as bio-engineers, computational scientists and immunologists — who will join forces with established UO researchers in the life, physical and prevention sciences, as well as those in management and communications. The building’s mezzanines and meeting rooms will be designed to create inviting public spaces. 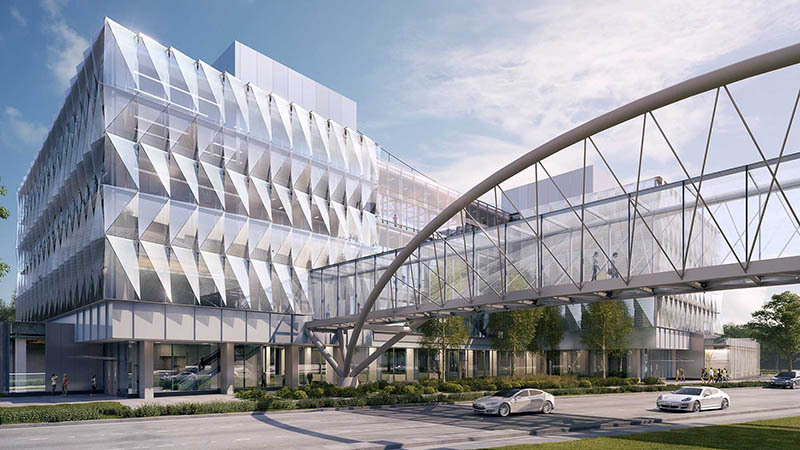 A signature sky bridge over Franklin Boulevard will connect the campus to other UO research facilities while creating a gateway corridor between Eugene and Springfield. Phillips said the groundbreaking marks an opportunity to celebrate the remarkably swift progress toward an ambitious goal.